My senior year schedule has been busy to say the least. I like most of my classes, but the homework load, especially in AP Bio, has been huge. A few weeks ago my class was learning about the macromolecules that make up life (carbohydrates, lipids, nucleic acids, and proteins, in case you were wondering). We spent a little bit of time learning about glucose and fructose, which are two types of carbohydrates that are commonly known as sugars. Even though the chapter was interesting, my favorite way to learn about sugar is through baking! That’s where these muffins come in. The original recipe listed them as cupcakes, but I think that in texture they were more muffin-like. However, in taste and sugar/butter level, they were definitely cupcakes. So feel free to call them what you want depending on what time of day you want to eat them. They would make an indulgent breakfast or a great dessert. 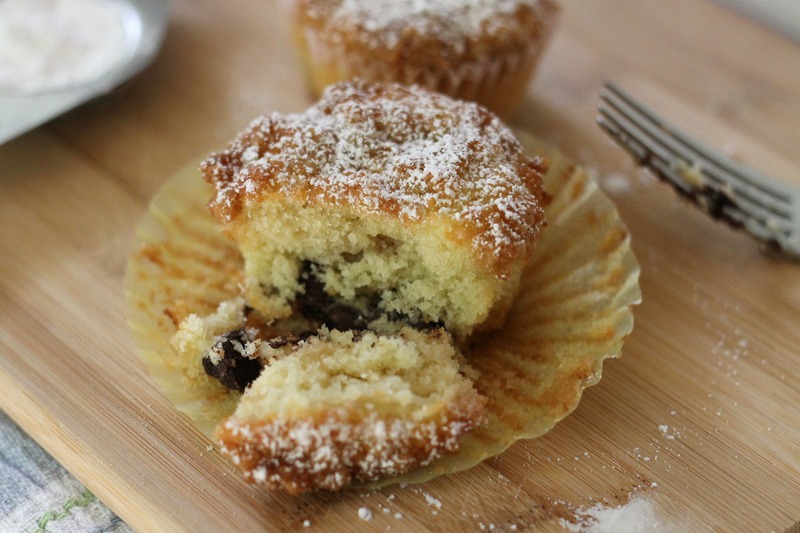 The flavor packed into these muffins is amazing because between the chocolate chips and the brown-sugar crumb topping, they have a cookie-dough like flavor. Cookie dough flavored muffins sounds like the perfect way to start the day to me! Preheat oven to 400 degrees F. Line muffin tins with 16 paper liners. In a large bowl, whisk together flour and sugar. Add butter, and using a pastry cutter or two forks, cut the butter into the flour until it forms pea-sized chunks. Sprinkle vanilla extract over top and continue to cut to combine. Refrigerate until ready to use. Whisk together flour, cake flour, baking powder, baking soda, and salt. Spoon 1 tablespoon of flour mixture into a small bowl and toss with 1/2 cup of chocolate chips (this will help prevent them from sinking too much). In the bowl of a stand mixer, beat butter and sugar until light and fluffy, about 2 to 3 minutes. Add eggs, one at a time, mixing well after each addition. Mix in vanilla, scraping down the sides of the bowl with a spatula if necessary. Add flour mixture in 3 additions, alternating with 2 additions of the buttermilk, starting and ending with the dry ingredients. Fold in flour-coated chocolate chips. Divide batter into muffin liners, filling each about halfway. Divide the crumb topping over the muffins. Bake muffins for 13 to 15 minutes or until a toothpick inserted in the center comes out clean. Remove from oven and sprinkle chocolate chips over top of cupcakes (optional; we didn’t do this since we used full-sized chocolate chips). Let cool for 5 to 10 minutes, then transfer to a wire rack to finish cooling. Dust with sifted powdered sugar before serving. Eat within three days. Enjoy!